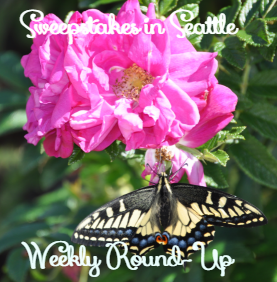 Sweepstakes in Seattle Weekly Round-Up 4/10 – Win $10,000, a trip to NYC, gift cards & more! Did you survive Spring Break this week? I think in some ways it was busier than my regular weeks! It was so nice this week, it felt like summer! We had a big winner this week – Serina won the Grand Prize from the Juicy Juice IWG!! Way to go Serina! Remember, Sundays I will only post the weekly round-up so you can get caught up and see if you missed any of the sweepstakes posted during the past week. Have a great Sunday and check back tomorrow for new sweepstakes! I’ll also share winner’s stories here, so if you win a prize, let me know and you can be a part of the weekly round up! Serina won the Grand Prize from the Juicy Juice IWG! Kimberly won a beanie from the Maxwell House IWG! DeAnn won a DK Literature book from a DK Publishing Sweepstakes! Congratulations! We’ve chosen your entry as a Runner Up Winner of the Whole Hog Burger Experience Contest. For your awesome post, you have won a $25 UNO Gift Card!